Crimp Tool Positioner. This positioner converts a DCT-1 crimp tool for use with TYPE-T2 contacts. It's also required for crimping high duty cycle Type-T1 contacts. 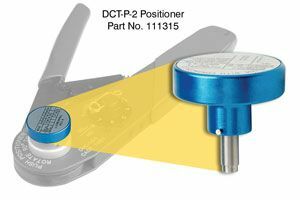 If you already own a DCT-1 crimp tool for TYPE-T1 contacts, purchase this crimp tool positioner to crimp TYPE-T2 and/or high duty cycle Type-T1 contacts.